The Bulldog Seedbank’s origins stretch as far back as 1975, when Dutchman Henk de Vries established the world’s very first coffeeshop. He named his new business venture after his most favoured companion, Joris, the Bulldog. Since that day 40 years ago, the Bulldog brand has become an empire, with 5 coffeeshops, 2 hotels and a merchandise line to rival any in the cannabis industry. The Bulldog Amsterdam’s newest venture is The Bulldog Seedbank. The company teamed up with some of the world's leading cannabis seed breeders to establish their very own range of seeds. The Bulldog Seed Company now offers a collection of 10 premium feminised cannabis seed strains for a very competitive price. The Bulldog Seedbank has spent half a decade collecting unique genetics and invested significantly into strain research & development to ensure that their collection is one of the very best in the industry. 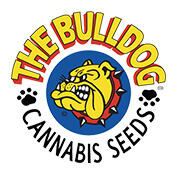 You can buy Bulldog seeds directly from Seedsman today.